Since I decided to undertake this project, I have been a little confused about what the difference between programming and coding is. Some people say they are roughly interchangeable, some people say they are completely different. This article says they are different, but my guess is that if you are not really familiar with either of these words, you will not really understand this article. I chose “coding” to title this blog, because I see my mission as one of learning about code, how it functions, and how to use it and write it. Maybe that’s programming, maybe not. I think I will probably be able to update this page as I learn more, but for now I’m just going to use the terms interchangeably. If you are someone who knows better and can offer a good differentiation/explanation…please offer it! I’m all for crowdsourcing good information. That’s the HTML code used to generate the teacher pictures on my full disclosure post. I didn’t write that…I inserted the pictures, and WordPress generated that. I know what purpose it serves, but I don’t know what any of it really means. As I continue this blog, I hope to learn that. HTML is used to create webpages, and HTML’s good friend CSS is used to design the look and feel of webpages. They are “languages”, but different from “programming languages”. 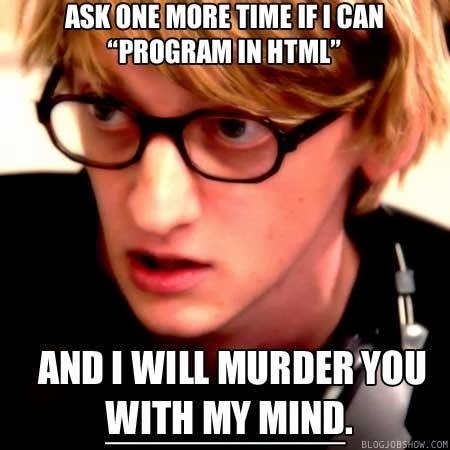 I could not use HTML to generate 4 as the answer to 2 + 2, but I could use HTML to make my website say 2 + 2 on it. Get it? I only think I do, but still consider this a major victory…I learned something! As I learn better ways to explain coding, I’ll offer them on this page. I know what I have right now is pretty lame, but I think I’ll get better! I think I understand what this ridiculous guy means!